When I began teaching at one of the oldest standing schools in Springfield, MA, I inherited two seven-foot-long wooden tables whose age rivaled that of the hundred-year-old school in which they were found. These beautiful, solid oak tables were once pristine and untouched by the years. However, time, use (and misuse) marred them — leaving a nonetheless rich testimony of the thousands of students that sat at them over the course of a century. These engraved tables tell the stories of hopeful relationships that were to last “4 ever,” folks that proclaimed existentially that they were “here,” and the occasional disheartening racial epithet decrying one group or another. Like those tables, students may carry a lasting imprint from their experiences—both positive and negative. A couple of years ago, at the end of a typical school day, a smattering of students spilled into my room to get extra help, work on a portfolio or have a quick conversation. Aakifa,* a student whose family had left Africa in search of freedom and opportunity, wore a brightly bedazzled magenta hijab. She came in quietly and began to work on an assignment, waiting until everyone had left to approach me. Her eyes welled with tears. Earlier in the day, a student targeted her because of her religion. He hurled painful and hateful words at her. Aakifa was called many things, but the word “terrorist” stung the most. She was angry and wounded. She expressed her love for this country and pride in her education. And she was devastated that someone could be so ignorant and cruel to say such things about her. These words were carved deeply into her mind and were carried with her as a reminder that, to some, she was not welcome. In the absence of information, I have seen people, sometimes students, create narratives and apply them to people who seem strange to them. And yet our schools, communities and cities are so diverse. I believe that the only way to create community and understanding is to share stories. It is through dialogue that we can experience empathy and find our shared humanity. Aakifa’s story has been carved into my mind. She is why all educators need to provide platforms for their students’ experiences, commentaries, and identities to be shared. Students spend so much of their lives in our buildings, and creating an inclusive space where all are received and acknowledged is essential. 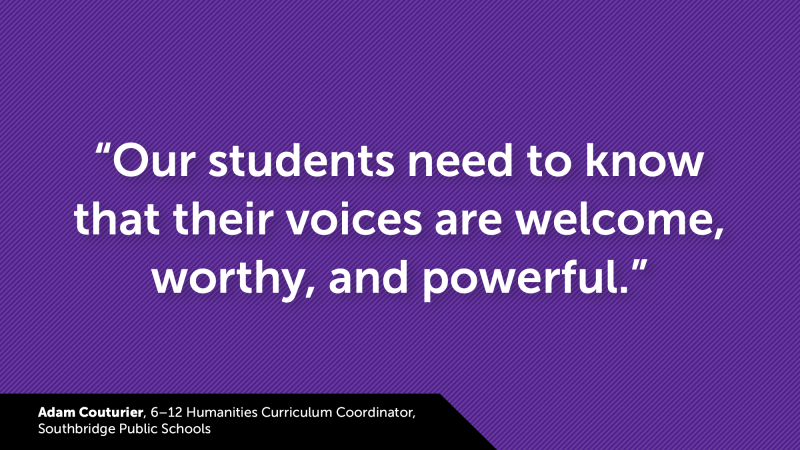 Our students need to know that their voices are welcome, worthy, and powerful. In Southbridge, MA, we have a diverse population; this diversity is our strength. Therefore, we are building into our curriculum ways for the entire student body to express this strength. It is essential to allow each student the opportunity to find and use their voice. To begin this curricular initiative, we designed a senior capstone project, The Voices We Carry. The goal is to expose our young scholars to the work of student journalists that are writing and recording personal commentaries (first-person narratives intended to connect personal stories or experiences to bigger social, political or cultural themes going on in the world today). This provides space for our students to share their own perspectives on larger issues by telling their own stories. The work is similar to what students are doing at New England Public Radio’s Media Lab. Through this project, students learn the tools of author’s craft and apply these tools to their own personal commentary. Once these personal commentaries are written, they will be recorded using the technology that exists in the majority of our students’ pockets: the ubiquitous smartphone. These digital files allow us to share our students’ amazing voices—not just within the school community, but the larger community of Southbridge (and beyond)—by hosting them online. Agency is a key design element in all our literacy initiatives within Southbridge Public Schools. Empowering students to choose meaningful books or share their personal narratives fit into the vision of We Read Big. Reading about others’ experiences or sharing our own helps us to demystify the world around us and binds us through community. This platform sends the message that we value the diversity of our students and that their stories matter.